Home overlooking Dingle Bay, absolute heaven. Great country side and sea views, situated in a naturally elevated position overlooking Dingle town at the mouth of Dingle Bay with amazing inner crest coast line views. This property truly offers a very impressive holiday experiences where you can relax and unwind in such a peaceful setting. The homes spacious interior is totally concentrated on luxury and the enjoyment of the surrounding natural beauty, if your lucky watch fungi the Dingle dolphin swimming in the bay from the comfort of the sitting room or enjoy an unforgettable sunsets over the bay with a good book or a bottle of wine from the terrace. This home is all about comfort and enjoyment. The large landscape gardens provide safe fun space for the kids to play while you watch the fishing boats go by. 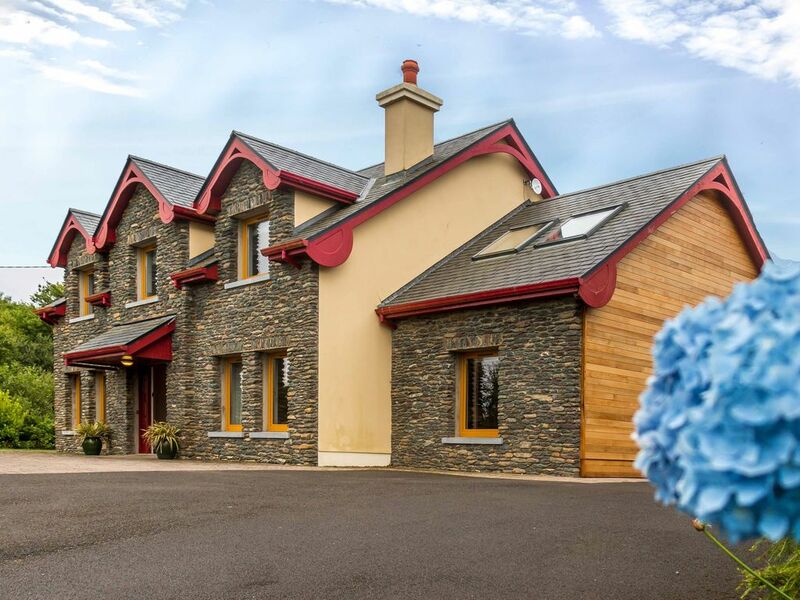 This spectacular home is just a 5 minute drive to Dingle town. If you are looking for a relaxing comfortable home from where you can enjoy the natural beauty of the Dingle Peninsula well this home is definitely the one for you. Dingle Area: The peninsula has something to offer to everyone. Among other things: sandy beaches safe for swimming, walking routes for all abilities, a thriving Irish language community, a rich musical tradition, fine dining, sea angling, arts and film festivals, talented craftspersons and some of the best surfing in Ireland. Once cited as 'the most beautiful place on earth' by the National Geographic; was voted among the top 100 destinations in the world ; CNN recently recommended it as a very favourable winter destination; it is listed as one of the top 10 places to be on New Year's Eve - all of these accolades refer to the stunningly beautiful Dingle Peninsula.There are so many things to see, to do, to explore, to experience on the Dingle Peninsula . . . from almost 2,000 archaeological sites, to more walking than you could fit into a year, to Fungie, a bottlenose dolphin who's been living at the mouth of Dingle Harbour since 1984, to a day spent on the Blasket Islands. Things to do: Golf is available at Ceann Sibéal links course about a 15 minute drive with the world renowned Ballybunion Golf Course is an hours drive. Rent a bike from the famous Mountain Man shop and explore the Slea Head Drive that takes in a large number of attractions and stunning views on the western end of the peninsula. Enjoy the landscape on horse back by taking a day out on the West Kerry or take a boat trip to the Blasket Islands. Its all about full and enjoyment in Dingle. The showers are power showers with a number of body gets to make the showering experience real relaxing. If you like showers unfortunately you might spend the whole holiday in the shower as it’s a real experience. The Jacuzzi bath caresses every mussel on your body, ideal after a long walk on the West Kerry Hills. Internet and wifi included. We are here to make your holiday the best it can be so if you have any specific requirements we can facilitate them once we are asked at booking stage. Beautiful house and gorgeous location. The seven of us all adored this house. There are wonderful little extras - the heated floors, recessed lighting. The only thing, and may be because it is end of season - but there are some maintenance concerns in the bathrooms. We certainly enjoyed our stay. Would recommend this place. Our large family reunion fit perfectly into this house...Outstanding! Stayed at the property with my daughters and 7 grandchildren. All had the most wonderful time. House was superb. Lots of space, very clean, anything we wanted was in the house - like home away from home. Just 10 mins from Dingle and once you have transport with you everyone can do their own thing. Kids took surfing lessons for 5 mornings, went horse riding, some went to wine strand in the afternoons, watersports, crazy golf or simply hung out in the peace and quiet of the house. Lots of space around the house for the kids to play soccer, hurling or tennis. Super week was had by all - kids asking if we could stay another week or were we going to do the same thing next year. Would highly recommend the property. The property is lovely. The gardens are beautiful, and the house is roomy and pleasant. The views from the front of the house are spectacular. Everything has been thought of, considered, and delivered with grace. Very nice house, has everything you would want for a relaxing vacation. Great view of Dingle and great location for touring Dingle peninsula. We hope to be back soon.